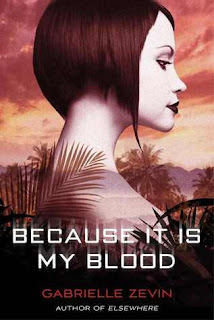 I liked book one in the Birthright series: All These Things I've Done (read my review here) but I loved Because It Is My Blood. Book one had so much world-building, and the plot was a little slow for me. I also had a hard time connecting with Anya. All These Things I've Done was still a really good read, but not one of my favorites. Because It Is My Blood; however, was outstanding. I loved it! Zevin writes with such smart, spare prose. It really made the book into an interesting and unique read compared to others in the genre. Just the premise of the Birthright world is so interesting: a world where caffeine and chocolate are illegal. Can you imagine? Because the Birthright world was built so solidly in book one, book two really took off with an action-filled plot. And since I already knew Anya and the way she thinks, I was able to understand her a lot better in this book. I really felt for her situation: she's just trying to protect the people she loves, but things keep going terribly wrong. I had one complaint with Because It Is My Blood, and this is pretty nit-picky of me, but the fact that Anya continually calls Simon Green by both names felt awkward. It slowed the book down for me, because each time Simon appeared, Anya called him by both names, and each time she did it, I inwardly cringed. Because It Is My Blood was so full of plot twists. I never knew what Zevin was going to come up with next. I love that! There were several events that took me totally by surprise. I really can't wait for the next book in this series. If it's anything like this one, it's going to be an excellent read!